With just 4 ingredients, these coconut shrimp are incredibly easy to make, but your guests will be all "You fancy, huh?" Using an electric mixer, whisk the egg whites until peaks form. 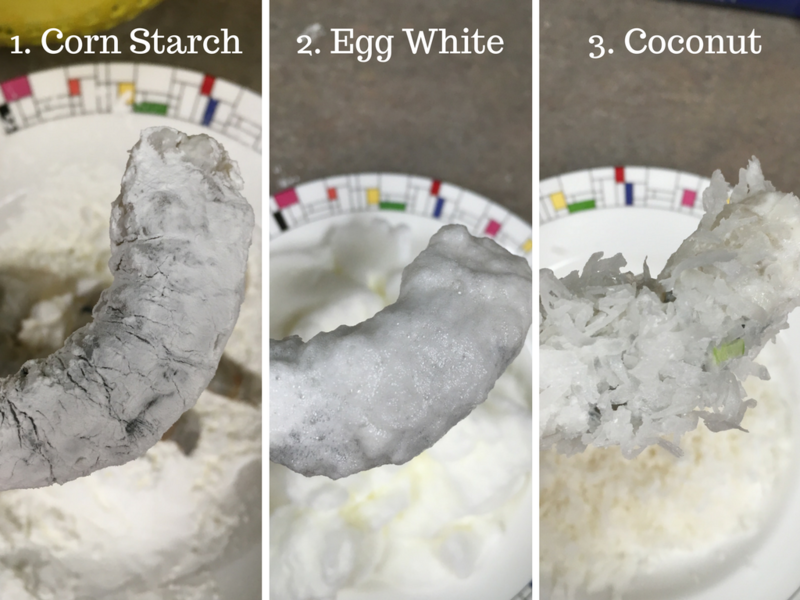 Pour corn starch, egg whites, and coconut into 3 separate, shallow bowls. Coat each shrimp in corn starch, then egg whites, then coconut and place on cookie sheet. Repeat dipping process until all shrimp have gotten the full treatment. Cook shrimp for 8 minutes, then flip them, and cook for another 5 minutes. BONUS: If you're feeling fancy, you can serve the shrimp with a dipping sauce - my favorite is 1/2 c. apricot jam with 1 tsp. diced jalapeno for a little kick! Repeat after me, Corn, Egg, Coconut.